Combining Celtic Trinity knot and spiral symbolism with an inspired Triple Moon Goddess and white quartz gemstones. 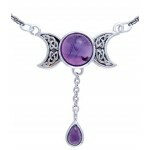 This stunning pendant features a white quartz inlaid gemstones in the crescent moons. 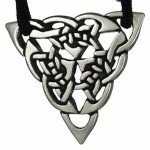 Pendant is solid sterling silver with an attached bail (chain not included). Item Number: PS-TPD4735 | Approximate Size (Inches): 0.94 wide x 0.05 deep x 0.62 high | Approximate Shipping Weight: 0.25 lbs.